Save money and get there by bus! The Go! Vermont Bus Network connects you to more cities than ever before, including NYC, Boston and Montreal. For City-to-City bus service routes and schedules, link to a servicing provider below. You may also view connecting cities on the City-to-City Map. To purchase tickets or to find detailed route information or fares, simply select one of the providers to visit their website. Still have questions? Call our Q/A Hotline today 800-685-RIDE (7433). 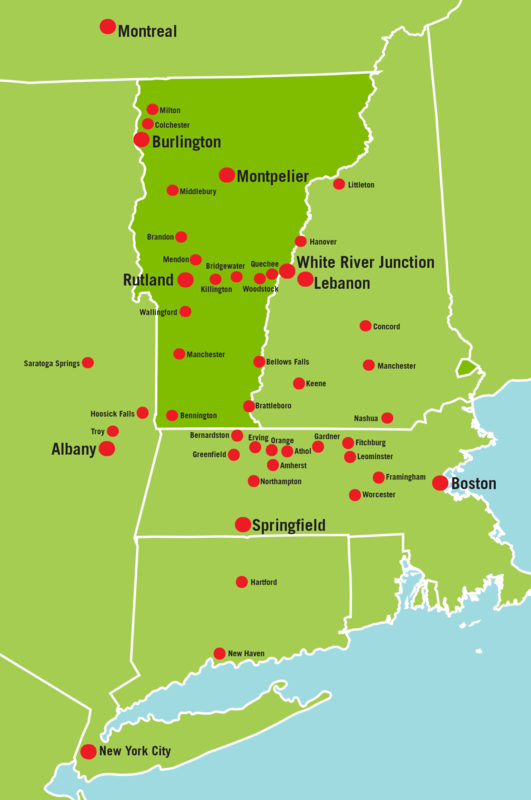 City-to-City routes include service from Burlington to Albany, NY via Bennington and Rutland, as well as service between Rutland and White River Junction, and on to Hanover, NH, with connections to Greyhound Lines, Inc.
New! The Vermont Shires Connector, a twice-daily shuttle service connecting the Manchester and Bennington areas of Vermont, known as The Shires, to New York City, via the Albany-Rensselaer Amtrak station in New York. 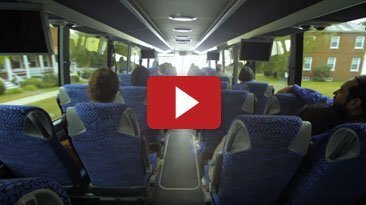 Whether you’re flying, taking the train, or a bus… Vermont Shires Connector will get you there. If traveling by train, connection to the Shires of Vermont is included! Watch this video to learn more. Please call the number above or visit the Vermont Translines website for more details or information. Daily express bus service from Burlington, with city connections to Montpelier and Boston. Call their toll free number, 1-877-GO2-MEGA (1-877-462-6342), or visit their website for detailed route information or fares. Offering service connections from Lebanon and Hanover, NH to Boston and New York City. Please call the number above or visit their website for detailed route information or fares. Service to communities throughout Vermont, including new service from Brattleboro / Bellows Falls to Boston! Call the number above or visit their website, for detailed route information or fares.